As opposed to the more traditional, purely medical approach to pain, namely pain killers, more modern approaches since WWII have involved techniques that are all geared to fostering self-control and self-management, hopefully that will encourage a patient to replace their feelings of passivity, dependence, and hopelessness with activity, independence, and resourcefulness. The crucial role of psychological and environmental factors in causing pain in a significant number of patients has only recently received attention. We know about the pain apparatus, the receptors, conducting fibres etc: but in focusing on this, medicine has overlooked the fact that the activity of this apparatus is subject to a constantly changing influence of the mind. In other words, pain is a construct as much as anything else. Let us look for instance at the work of Bleecher in WWII. He evaluated requests for painkilling medications by soldiers following combat wounds and compared these requests with civilians with comparable surgical wounds; the majority of soldiers denied having pain or reported that they didn't need medication for their pain, whilst 80% Civilians in contrast, experienced much more pain and wanted medication. Psychological factors, such as emotional state and secondary gain affected pain perception overall. W.E. Fordyce and colleagues, in 1985 began evaluating behavioral methods for treating pain and chronic pain behaviors. These were not intended to treat pain in the traditional sense of directing attention to sources and mechanisms of noxious stimuli generating injury signals which lead to pain: behavioral pain methods do not have as their target the modification of nociception nor modulation of the direct experience of pain. They are intended to treat excess disability and expressions of suffering, rendering chronic pain patients functional again and as normal in daily activity as possible. These researchers made certain new assumptions. Pain may initially result from some underlying organic pathology, but environmental consequences can significantly modify and further maintain various aspects of pain behavior. These may include complaining, grimacing, bracing, requesting medication, avoidance of movement and so on. In viewing pain as an operant behavior, they assume that the consequences such as attention from doctors and others, rest, medication and avoidance of unpleasant responsibilities and duties would reinforce maladaptive pain behaviors and hinder progress in treatment. Family members were actively engaged to react to patient behavior in a manner that would reduce pain and maximize compliance with rehabilitation. Patients were taught to reinterpret the sensation of pain and tolerate it while performing more adaptive behaviors that would gain the attention and approval of others. By 1996, following on after Lazarus 1971 coined the term Broad Spectrum CBT to demonstrate the utilization of several different treatment procedures in CBT, Bradley demonstrated the efficacy of these approaches in relapse-prevention training, which may include systematic desensitization, progressive muscle relaxation, modelling, behavior reversal, contingency management, stimulus control techniques, cognitive restructuring, self-control techniques, and comprehensive stress management programs. Functional Restoration Treatment thus emerged. This was a comprehensive interdisciplinary approach, referring to a broad conceptualization of the entire pain problem, its diagnosis, and management. This does not rely solely on the patients' self-report of pain and on skeletal imaging, but relies on more objective quantification of functioning, such as structured interviews and quantified self-report, being modelled after a sport's medicine approach to varying intensity and duration of interventions aimed at restoring physical functional capacity and social performance. It is also designed to decrease medication, improving QoL, increasing physical capacity and endurance, decreasing social problems associated with chronic pain and a focus on realistic goals. As Kugelmann says, people make pain as surely as they make love. Both boil down to a human experience. 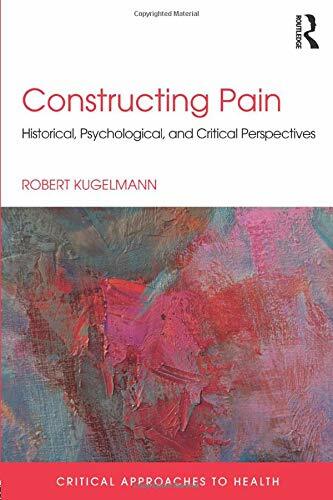 Given the above, Kugelmann divides the book into the historical perspectives in which pain has been constructed as a feature of our anatomy, from the 19th to late 20th Centuries, with the divide between this and the modern phenomenological approaches being defined by our ability to anaesthetize pain entirely, thus changing the way we think and interact with pain. As psychology advanced alongside the medical advances, so only 'real pain' in response to peripheral nervous insult was considered, until the '60's anyway. Until then, psychogenic pain was dismissed in the dualism of the times. In more modern arguments, such as this, this is replaced with embodied subjectivity, a phenomenological notion, in order to overcome the limitations of the anatomical image of the bodily pain. Early approaches to pain of course required both surgeons and patients to be stoic and hope the operation ended quickly. Intensity and duration of pain are processed differently, as Dan Ariely has pointed out, and so perhaps the idea was to let the patient suffer intense pain for short periods of time, or the reverse. Nevertheless, anesthesia was clearly a relief for both patients and their surgeons, but it changed the way pain was viewed. At the same time, the invention of analgesics was changing back-room laboratories into 'big pharma'. The effects were untoward: as pain become controllable, the fear of addiction in pursuit of painkilling emerged. This may have come with a decline in the patient's willingness to bear pain in a stoic fashion, as described above in Bleecher's work, where soldiers were predisposed to cope with discomfort in general, and pain in particular. Pain had not become meaningless at all, but was changing its place in a system of values, becoming, in Kugelmann's words, a scandal. The point was that we, once exposed to the possibilities of avoiding pain, became less tolerant for any amount. Opioids as cause of death in the USA is just such a scandal at this time. However, on the next page, Kugelmann writes that pain rendered increasingly avoidable does become meaningless, and to tolerate pain when treatment is there, is just foolishness, not brave or an expression of patience. In this way, chronic pain serves no biological purpose, not a warning or anything else useful, such as go and rest for instance. Chronic pain is destructive. Pain is more painful when we face it alone, and is a sociohistorical construct, or at least our 'increased sensitivity' is. Kugelmann continues with a long list of psychological and medical views that then emerged beyond this formulation, driven as much by the environments of the researchers as much as anything else. Kugelmann challenges the dualism that emerged by constructing pain 'nondualistically'. Livingston, Melzack, Wall, Hebb, and others, merged to produce the gating theory of pain, namely a decision making system that decided what pain would be felt or experienced, and what would not, as pain seemed sneakily able to circumvent blockades and re-insert the experience of pain. Pain now had a new metaphor, and became more of a process of body and brain. Borrowing the term from electronics however led to the idea of a gating switch, an idea which Wall and others lamented as misleading. As the thinking evolved, and as psychiatry joined in, Thomas Szasz entered the fray in terms of defining the sensation of pain and the experience of the pain as separate, which he saw as a problem if it denied the patient's experience of suffering. Even though the language of physiology and psychology were addressing the same phenomenon, Szasz wanted them kept distinct. In this way, they do not refer to distinct things, but to distinct ways of describing the same thing. One is confusing words and things. Into this discussion came Engel, who asserted that pain always has an affective aspect, and the experience of pain is always a psychological phenomenon, in the '50's, and long before Wilbur Fordyce and colleagues. Kugelmann brings Fordyce into the discussion, with his structuring of attention or social feedback. The continuing discussion of both the social and other phenomenological features of pain dominate the last two chapters. It should be clear by now, given the application of philosophy to medicine and vice versa, that this is the substance to Kugelmann's review of the study of pain, within the concept of a broken world, which influences our approach to pain and how we experience it. To test a construct, of any kind, we need to see if it has validity, not a small task. So if we say we are measuring or treating pain, we need to know if what we think we are testing, actually exists. Defining what exists has been the goal of this book, by penetrating the phenomenology of pain as a construct.